Let's face it, parents try their best, but some of their advice is just plain weird. Not all of it, though. This is one thing Mom got right, and it can help protect you from obesity and diabetes! When you were a kid, how many times did your mother tell you she'd slaved over a hot stove for hours and that the least you could do was to "slow down and enjoy your food!" You thought she was just being a nag. Turns out she knew then what medical researchers are only now learning: Eating fast is bad for you. A team of endocrinologists at Lithuanian University of Health Sciences published a study that suggests a strong connection between eating fast and elevated risk for Type 2 diabetes. Apparently what goes on in your mouth has a lot to do with how quickly your stomach and your brain can communicate with each other. As part of the study, researchers assembled 234 people who had recently been diagnosed with Type 2 diabetes and 468 people who, overall, matched the people with diabetes in terms of gender and age. The entire group of male and female volunteers followed a pre-meal protocol that included avoiding smoking and heavy exercise prior to a meal. After the volunteers dined together, researchers asked them to rate the speed at which they ate compared to the other volunteers. Based on before and after measurements of BMI, waist circumference, and glucose and triglyceride levels, the researchers found a correlation between the people who ate fast and those diagnosed with Type 2 diabetes. When the researchers factored in each individual's family history of diabetes, educational level, morning exercise, and cigarette smoking they found that eating fast caused as much as a two-fold increase in risk. How does it work? As the authors explained in the study, "If food is eaten rapidly, there may not be enough time for the secretion of hormones responsible for signaling that the body is full. Thus, a sense of fullness is delayed, resulting in greater caloric consumption." As the study authors note, the resulting obesity often leads to increased gains in adipose tissue, around the waist in particular. This kind of tissue, they note, has a number of abnormalities including decreased insulin sensitivity and increased insulin demands. It is the presence of this kind of tissue with these characteristics that can increase the risk for Type 2 diabetes. Maybe your mom wasn't right about everything. Maybe it didn't matter if your room looked like a bomb went off in it. But, she was right about one thing: Eat slowly and chew your food. Your body—and your waistline—will thank you! Want to get systematic about your eating pace? 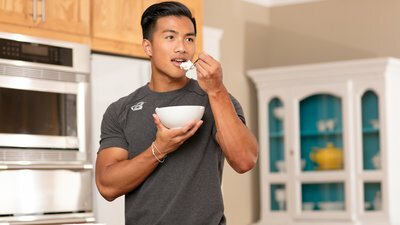 Bodybuilding.com's Nutrition Tactician Paul Salter has five simple strategies to help you slow down your eating to speed up your fat loss. If you're avoiding chewing because you don't want to have to taste your awful cooking, we've got you covered there, too! Chef Robert Irvine's chicken recipes and steak recipes will give you multiple meal options you'll gladly slow down to savor. Radzevičienė, L., & Ostrauskas, R. (2013). Fast eating and the risk of type 2 diabetes mellitus: A case-control study. Clinical Nutrition, 32(2), 232-235.